Thinking of using a 3rd Party Kitchen installer? Q: What does 'thermowrap' mean? A: A high gloss foil is wrapped around the front and side edges of the panels and bonded using heat and a special adhesive. Q: Does it come with soft close? A: Julia and Euro systems come with soft close hinges and soft close drawers. The exception to this is corner cupboards which come with standard hinges and slow-down close buttons to give a similar ‘soft close’ effect. Also the 200mm wide pull out basket base cabinet and the pull out rubbish bin have standard closing runners. Q: Do drawers come with cutlery trays? A: Drawer cabinets do not come with cutlery trays/inserts. However we can supply these for certain size drawers at an extra cost. Look in the accessories section of our products. Q: When should I remove the protective film on the doors? 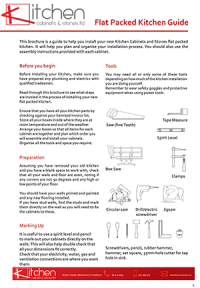 A: Once you have finished the installation and cleared the space of all tools etc. you can remove the film. Once removed it is advised to allow 7 days before cleaning or touching the doors as this will give the thermal wrap surface time to react with the air and harden. This will ensure maximum scratch resistance of the surfaces. Q: An item I want is out of stock, how soon will you have it? A: We have containers of stock arriving every 2-3 weeks, however the containers do not contain every item. Therefore the wait could be up to 3 months as this is the time it takes to manufacture and ship our items from Europe. Q: Can I return an Item if I have already opened it? A: Unfortunately we cannot accept returns due to change of mind, so make sure you select the appropriate items prior to purchase. Please contact us for more details. A: Please check all boxes and make a COMPLETE list of any missing items. Each box has an assembly manual with a list of all the items included. Each item has a unique code – you need to provide us with this code(s) for the missing item(s) and quantity that are missing. Then email us this list to info@kitchencabinets.co.nz. Q: What do I do if my cabinets are damaged when they arrive? A: Read the note attached to the palette about damage. You must mark the delivery driver's con-note as ‘DAMAGED’. Please call us right away. If you collected your items from our warehouse and discover damage to your products inside the packaging, you must bring them back to us and we will inspect and replace them for you. Q: Can I just buy one unit? A: Yes, our cabinets are packed individually so you can buy any amount you like. A: Delivery cost is calculated by the size and weight of your order and the delivery destination. If you place an order online there is a shipping calculator before checkout. Simply fill in your location and zip code and click update to add the delivery cost to your order. Alternatively you can send us an email with a list of your order and address and we will inform you of the shipping cost. Q: Do you deliver or do I have to pick up? A: We can provide delivery to almost anywhere in New Zealand for an additional charge, or you can pick up your items from our warehouse in Albany. Q: What warranty do your cabinets come with? A: Euro range cabinets come with a 5 year manufacturers warranty. Julia range cabinets come with a 2 year manufacturers warranty. Niki range cabinets come with a 1 year manufacturers warranty. Q: What warranty do your Stone Bench-tops come with? A: Our cabinets are manufactured by our factories in Europe using the latest standards of technology. We then import them directly to our warehouse. We source all our parts from Germany, Italy and Poland. 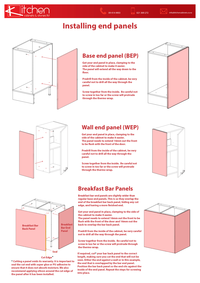 Q: Are your cabinets flat packed? A: Yes. 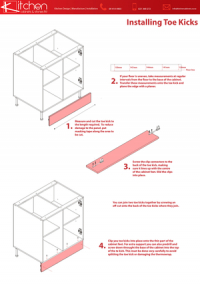 All our cabinets come in flat-pack boxes including assembly instructions, hinges, runners, screws etc. Q: Do your cabinets come in other colours? A: Depending on your choice of system. Within the Euro system there is a choice of different colours/finishes for the fronts. You can view these on our website or our catalogue. The Julia system comes in High Gloss white or Sonoma Oak, and the Niki system comes in only Satin white. Q: Do your cabinets include toe kicks? A: Niki and Julia systems include an individual toe kick per cabinet, made of matte white standard melamine board. Euro cabinets do not include toe kicks. Thermal wrapped foil MDF toe kicks can be purchased and are available in High gloss white , and also other colours to match Euro colour choices. Q: Are bench tops included? A: No. Benchtops are not included in the price. We can supply custom made laminate or stone benchtops in a wide range of colours. These are priced based on the layout of the kitchen, and number of cut-outs for sinks, hob, taps etc. Q: Do your cabinets include handles? A: Niki system cabinets include silver composite handles (96mm). Julia system cabinets include stainless steel square handles (160mm). Euro system does not include handles, except when you choose ‘Zobal’ finish which includes recessed aluminium handles. Q: Can I mix and match between systems? A: To an extent, Yes. Euro system cabinets can match Julia system cabinets if you choose ‘High Gloss White’ colour and add Julia stainless steel handles. This way the cabinets will look identical, just the internal hardware will be different. This may help if certain cabinets are out of stock or only available in 1 system. Q: Can I buy carcasses/bodies separately? A: Yes you can. All our cabinets are standard New Zealand sizes. So the depths and heights for all types of cabinets is standard. Q: Can I buy doors separately? Q: What is the thickness of our end panels? A: Our end panels are 16mm thick.